Risotto, that sublime Italian rice dish with a reputation for being incredibly time consuming and fussy. In reality it’s really pretty simple to pull together. Hot broth in one pot, toasted arborio rice in another. A wooden spoon, a bit of butter and cheese. A smidgen of patience and buon appetito!… Risotto like you thought you could only get in a restaurant. Yes the spoon has to be wooden (so as to not damage the grains of rice). Yes the broth has to be warm (it’s more easily absorbed than cold stock). Yes you need to stir the rice almost constantly and it needs to be served IMMEDIATELY or it becomes dense and gluey. But that’s a small price to pay for a creamy, rich and luxurious dish of perfect risotto. You can get fancy and add asparagus or sweet peas to this risotto, but it’s perfectly perfect without it as well. Abbondanza! Place the stock in a tall sided pot and bring to a boil. Once boiling reduce to a low simmer to keep warm. In a large high sided pan with a heavy bottom, heat oil and sauté onions until nearly translucent, about 5 minutes. Sprinkle with salt, add the rice, stir to coat with oil and sauté with onions to toast each grain, another 5-6 minutes (stirring frequently). Once toasted slowly add the white wine, stirring gently with a wooden spoon. Once the rice has absorbed the wine, add 1 cup of warm stock and stir. Allow to cook until stock has been absorbed. Add a second cup of stock to the pan, stir gently and allow the rice to absorb the liquid and the pan to once agin become dry. Continue to stir frequently and add the third and final cup of stock to the pan, cook once more until dry. Roughly chop half of the shrimp. Add all of the shrimp to the risotto, stirring gently and cook until they are just pink, this will only take a few minutes. Remove the pan from the heat, add the butter, cheese and heavy cream. Gently stir to melt the butter and combine ingredients and serve immediately. *To create shrimp stock I simply placed the shrimp shells and some water in a small saucepan and allow it to for for an hour or so. Strain the liquid and voilà— shrimp stock. Yup that’s right, school’s out for Summer— and frankly not a moment too soon. I was quickly approaching my school year breaking point. I’m tired of remembering assigned snack days, helping with school projects, making lunches and yelling “hurry up we’re late!” on a daily basis. I need the slower pace of Summer; the laid back mornings, the swimming after dinner evenings. I need a break. My parents had planned on coming to spend a few days with my kids the first week of summer vacation, they would all get some quality time together and I would get a few more uninterrupted days at the office. However as a surprise (and perhaps because they sensed my approaching breaking point) they instead offered to take the kids back to Connecticut with them for the better part of the week. “What do you think?” they innocently asked. “Are you kidding… They’re yours!” I said tripping over my own feet in the mad dash to get upstairs and pack their suitcases before anyone realized what had just been agreed to. Naturally the kids were just as overjoyed as I was at the idea of a week at Grammy and Grampy’s house. (It’s common knowledge that the rules at their house only vaguely resemble the rules at home. And when I say vaguely, I really mean not at all.) So off they went with barely a backward glance and off I went to enjoy the quiet of a child-free home. And blissfully quiet it was. Flash forward 24 hours— My husband comes home and announces that he has to go away on business while the kids are in Connecticut. “Wait. What? Do you mean to tell me that I will be here all alone?” Yup that’s right folks. I was alone for 24 hours. Alone. Let me type that again… ALONE. It was wonderful. Sure I had to make the coffee and empty the dishwasher (typically my husband’s jobs since he gets up earlier than I do) and sure the damn dog killed another bird and it was up to me to pick up the mangled carcass; but that was a measly price to pay for 24 hours of me-time. I have a girlfriend who eats cold cereal whenever she’s home by herself at dinnertime. Her theory is one bowl + one spoon = zero kitchen mess. I’m the exact opposite. When mine is the only palette I have to please I cook exactly what I want regardless of the prep and process involved. I pull out every pot and pan, make a mess and leave the disaster to be cleaned up when I’m good and ready. With this in mind I spent the “afternoon of my aloneness” (that’s how I plan to refer to these 24 hours when I think back on them fondly) mulling over what to make for dinner. Something spicy (of course), maybe with seafood and definitely the kind of meal the kids would moan and groan over. I ultimately decided to make a curry; a shrimp and coconut green curry to be exact. It turned out to be exactly the type of meal an afternoon of aloneness begs for. A meal that made this “loves her family but not missing them one iotia and couldn’t possibly be enjoying the solitude more” wife and mother very, very happy. This was a delicious dinner… and I was the perfect dining companion. In a large high sided skillet or wok melt the coconut oil. Add half of the scallions, curry paste and ginger and cook for 1 minute. Add to the pan the garlic, shrimp and vegetables and cook for 2-3 minutes. Add the coconut milk, fish sauce, Tamari and cayenne pepper and allow to simmer until the shrimp are pink and cooked through. Remove the pan from the heat, stir in the julienned basil (adding it at the end will keep it green) and serve over Jasmine rice. Garnish with fresh cilantro, diced chilies and additional Tamari if desired. “Now watermelon time is here. And says it’s ripe and very soon, A splash of pink comes into view. We know exactly what to do. There are few more perfect symbols of summertime than watermelon. It’s a sweet, refreshing and all-American barbecue favorite, which also just happens to be a nutritional powerhouse. According to The National Watermelon Promotion Board (who knew?!?) “2 cups of watermelon chunks contain 25% of your daily vitamin A and 30% of your daily vitamin C. Watermelon also contains B6 (6%) as well as potassium (8%), phosphorus (4%) and magnesium (8%).” Not bad stats, right? We go through a lot of watermelon in our house, on average one good-sized melon a week. My kids and most of their friends consider it to be the perfect anytime snack and I often throw a handful of chunks in my morning smoothie. But I recently started thinking about other ways to use this sweet treat, possibly in a more savory fashion. What did we ever do in the days before Google?… I found recipes for pickled watermelon, blw’s (bacon, lettuce and watermelon sandwich), watermelon pad-thai, and even grilled watermelon burgers with cheese; but none of these recipes begged to be tried. No, the recipe I decided to get watermelon crazy with was a grilled shrimp and watermelon salad with feta cheese, onion and avocado and tossed with a honey-lime vinaigrette. I happen to be a fan of savory/sweet flavor combinations. Jelly and cheese sandwich… sure! 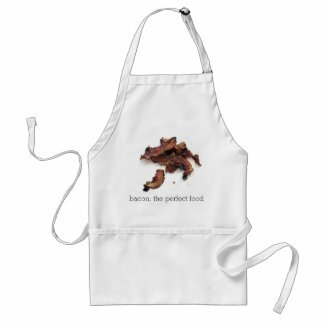 Candied bacon… yes please! Carrot sticks and peanut butter… but of course! However I’ve never eaten watermelon as anything but a component of fruit salad, a sweet and refreshing end to a fun barbecue or as an addition to a smoothie, so I was intrigued as to how this seemingly crazy savory/sweet salad would turn out. This is the craziest, yet most delicious combination of flavors you’ll ever put together. Try it once and it will be your go-to summer salad! In a small bowl combine the 1/2 tsp. of salt, chipotle powder, paprika and garlic powder. Sprinkle it over the raw shrimp, making sure they are completely covered with the spice mixture. Light the grill. While it warms up slice the watermelon and place in a strainer to allow some of the juice to drain out. Quickly grill the shrimp and set aside. In a small bowl whisk together the lime juice, honey, olive oil, salt and pepper. Combine the shrimp with the onion, watermelon and avocado. Add the feta cheese and cilantro, drizzle with the dressing and gently toss. There are some nights when dinner at our house is a leisurely, dare I say enjoyable affair; everyone is in a good mood, eats their meal without complaint and is rewarded with something rich and decadent for dessert. But then there are nights when everything is rushed, everyone has something to complain about and dessert is nothing more than yesterday’s memory. Sometimes I can anticipate ahead of time that were heading for disasterville and cook accordingly. Breakfast for dinner always makes them smile, my turkey meatloaf never fails to get a thumbs up and believe it or not any meal featuring shrimp is a Greco family favorite. Shrimp sautéed with onions and garlic over spaghetti, shrimp and veggie shish kabobs or even super easy shrimp stir fry is always a winner. To really make this a quick weeknight dinner you can buy pre-cut veggies and use instant brown rice. Place the cleaned shrimp in a small bowl. Mix together the water, sesame oil, soy sauce, vinegar, cornstarch, and sugar. Pour mixture over the shrimp and let marinate for 10 minutes. After 10 minutes remove the shrimp and set aside, but reserve the marinade. Cut the vegetable into bite-sized pieces. Heat the peanut oil in a wok or a 12-inch skillet over medium-high heat. Add the garlic, ginger and all the vegetables (except mushrooms and snow peas) and cook for 3 minutes, stirring frequently. Add the mushrooms and snow peas and cook another 2-3 minutes or until all the vegetables are nearly cooked through. Remove vegetables from pan and set aside. Add the marinade to the pan and heat until it begins to thicken. Add the shrimp and cook about 3-4 minutes or until shrimp are just pink. Stir in vegetables, coating evenly with the sauce, cover and let cook an additional 2-3 minutes until everything is heated through and the broccoli is crisp-tender. Serve over brown rice and garish with additional sliced scallions, chili flakes and soy sauce if you like. I recently went to see a man about some chickens. No I’m not speaking euphemistically here, I mean actual chickens; hens to be exact. I’m kicking around the idea of perhaps keeping a few in my backyard. Oh what lovely fresh eggs we could have! I’m sure to some of you this seems like no big deal, what’s so strange about having a couple of hens or maybe even a pigmy goat? But the rest of you are probably laughing too hard to even be able to continue reading this. In case I haven’t mentioned it before I live in Northern New Jersey, roughly 11 miles outside of New York City. So close that I imagine if you stood on my roof and looked East you would see midtown Manhattan— not exactly farm country! But that hasn’t stopped me from trying to make the most of my little plot of land. (My mother, who actually does live in the country, gets the biggest kick out of my urban agriculture and refers to my yard as “Green Acres.”) Anyway, I currently have two raised bed gardens filled with veggies (with plans for a third dedicated to garlic, leeks and onions) and a half-dozen or so containers overflowing with a variety of herbs. The kids and I water, tend and harvest something wonderful from our backyard nearly everyday. While last months heat wave had some dire effects on my cucumbers and squash, the remainder of my garden seems as happy as ever. My cherry tomatoes, jalapeño and cayenne peppers and corn are all ready for the picking, my basil is huge (but has started acting like it wants to start flowering) and my leeks have grown big enough to rival store-bought. “Wouldn’t it be wonderful,” I thought to myself, “if I could make something delicious with this bounty from my garden. Something simple that would let each homegrown ingredient shine.” I started flipping through some cookbooks for inspiration and decided pretty quickly that Ina Garten was the way to go. I love the Barefoot Contessa for her relaxed unpretentious style, her simple, delicious and totally accessible food and the way she seems to enjoy the process of planning and executing a meal the same way I do. I would channel my inner Contessa and come up with a sensational meal. The dish I ended up making was a sautéed cherry tomato, leek, roasted shrimp and feta cheese combination— and holy cow was it good! I used every ripe vegetable my garden had to offer, some lovely fresh herbs as well as sweet shrimp and salty feta. Served over a little orzo with some crusty bread and a glass of white wine, it was summer perfection in a bowl. This combination of garden fresh veggies and herbs, sweet shrimp and zesty lemon is fantastic as a first course, entrée or even spooned over thick slices of grilled bread as an appetizer. Preheat oven to 400°F. In a large ovenproof skillet heat 3 tablespoons of oil over medium-low heat. Add the leeks, garlic and hot pepper and sautee for 5 minutes. Add the wine and bring to a boil, scraping up any bits that have stuck to the pan. Cook for 2-3 minutes, until the liquid is reduced by half. Add the cherry tomatoes, tomato sauce, oregano, salt, and pepper to the skillet. Simmer over medium-low heat, stirring occasionally, for 10 minutes. Arrange the shrimp in one layer over the tomato mixture and sprinkle the crumbled feta evenly over the shrimp. In a small bowl combine the bread crumbs, panko, parsley, basil, and lemon zest with the remaining tablespoon of olive oil and sprinkle generously over the shrimp. Bake for 15 minutes, until the shrimp are cooked and the bread crumbs are golden brown. Squeeze the juice of 1 lemon over the shrimp and top with additional fresh basil. Serve over orzo, rice or on grilled bread. I love soup. Winter, Summer, morning or night; there is something so soothing about a nice warm bowl of homemade soup. It’s the perfect meal; one bowl, one utensil, one nice full belly. After making the pesto and goat cheese appetizers last weekend, I still had half a package of wonton wrappers to find a use for. Having just used them in a non-traditional manner, I thought perhaps I should consider using them for their intended purpose. I had never made a dumpling or ravioli before, but since wonton soup happens to be one of my daughter’s most favorite foods, I was willing to give it a shot. It turns out that making won tons is not only fairly easy to do but also quite gratifying. My homemade wontons actually looked and tasted like the take out version, only infinitely better. The wrappers were thinner, which made for lighter wontons, the pork filling was fresh and flavorful and the soup was really delicious with the addition of shrimp, Napa cabbage and a touch of sesame oil. Attempting something for the first time only to discover that it’s both easy and rewarding is such a lovely surprise. I’m still marveling at just how simple and tasty this wonton soup was and how much my entire family enjoyed it. And rest assured, I will absolutely be making it again soon. 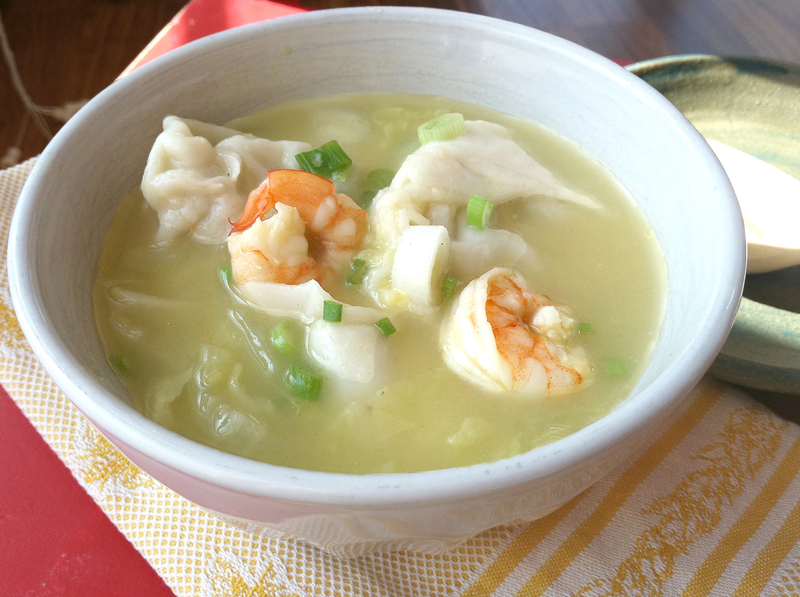 I added shrimp and Napa cabbage to my version of this soup. But straw mushrooms, a bit of broccoli or thin sliced carrots would work as well. Slice the green onions and set aside all but 3 tbsp., finely chop those and put in a large bowl. Add to the bowl the pork, sesame oil, tamari, garlic, egg, salt and pepper. With a fork, throughly mix the filling together. Spoon a generous 1/2 tsp. of filling into the center of a wonton wrapper. Lightly moisten the front edges of the wrap with water and fold the wrapper in half (into a triangle shape) and press together to seal. Moisten the front two corners with water, bring them together (overlapping them) and press to seal. Set completed wontons aside and cover with a damp paper towel until ready to cook. In a large pot, bring the broth to a boil. Drop the wontons into the boiling broth and allow to cook for 4 minutes or until they float to the surface. Once all the wontons have floated to the surface reduce the heat to simmer and add the shrimp and cabbage. Simmer for 2 minutes, until the cabbage softens a bit and the shrimp turns pink. Ladle into bowls and garnish with the remaining green onion, a drizzle of sesame oil and a splash of tamari.